Selecting curtains is a lot like selecting clothes. The choice depends not only on what looks good, but what their purpose is. Lots of interior decorative items can look amazing on their own, but will the curtains work on the specific window you’re wishing to hang them one? And will it be right for the activities in that room? What works in a nursery probably won’t do for a formal dining room. We’ve put together some tips and tricks for choosing the perfect curtains for your home. Maybe you have the same carpet running throughout the house, however having the same kind of curtains in every room can often leave a lot of creative potential unfulfilled. Some rooms need light and airy curtains, while others might need a heavier fabric. It depends on the purpose of the room and how much daily sunlight that room receives. The other big factor is what colour the walls are and what furniture you have. It’s important to make sure that all the colours in the room complement each other, to avoid an unsightly clashing. 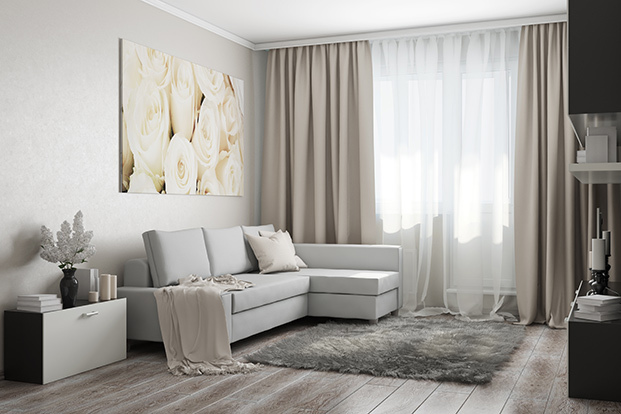 According to the interior designers at Decorlove, adding a bright curtain with beautiful drapery is a great way to add a feature piece to any room. Curtains can easily lift a room’s colours and make it feel larger and brighter, however it’s important to take into account the fabric, colours and specific curtain system, to make sure it’s the best fit. If you want to have the curtains blend in rather than stand out, pick something that is slightly darker than the walls, or a subtle shade that is already part of the room. A fine print can also work, if the windows are not the dominant feature in the room. Fabrics offer another amazing range of choices when it comes to picking curtains for your home. According to Alice Guercio, Vice-President of American curtain manufacturer Kravet, linen, faux silk and velvet are the best choices, as they hang best, falling beautifully. Faux silk is hardier than the real thing, as well as less expensive, so could be a good option if you’re taking your bidget into consideration. Choosing a fabric style also depends on the style of the room it is going to be hung in. A heavy velvet brocade is obviously not suitable for a child’s bedroom, and should be kept for more formal rooms such as the dining room or hallway. Bright prints work best in well-lit rooms and the less formal parts of the house, such as the family room and the kitchen. What do you want the curtain to do? Is its purpose to block light, or do you need it to be translucent so it can let through as much light as possible? Do you want it to create privacy by shielding the room from the street or the neighbours? For example, if you’re putting drapes on a picture window, you want them to be light and easy to open, so that you can sit back and enjoy the beautiful outside view. Of course, in some situations you will want both light and shade, privacy and a view. In that case, you probably need to use a heavier drape that can be left open, with a sheer, lighter shade of fabric behind it, so that some light can still be let in during the day. Many parts of Australia have a warm or quite tropical climate. Curtains are a great way to keep the heat out and still enable you to enjoy the benefits of air conditioning. Specially designed ‘thermal curtains’ can do the opposite in winter by retaining heat inside. Heating and cooling will often make a heavy curtain cost-effective if it helps insulate a window that would otherwise be a big drain on a comfortable indoor environment. Typically, designers suggest hanging the curtain rod 15cm above the window, however in some rooms, a more dramatic effect can be achieved with a higher rod. It depends on the size of the window and the height of the ceiling. Ideally, the curtain rod and the curtains should extend 10 to 20 centimetres beyond the window’s sides. Of course, curtains can also decorate a room, with bold block colours and simple patterns being great choices. Recreation rooms and children’s bedrooms are the best rooms for curtains that experiment with crazy patterns, bright colours and features such as tassels. Mermaids, spacemen and the like often fit well with the toys and posters that decorate tween bedrooms. Horses and cowboys, wild animals and fairy gardens are other possible themes for children’s bedrooms. If you’re using period design with strong wallpaper patterns like a regency stripe, then a solid colour will be most appropriate. In a light, neutral room with little or no colours, simpler patterns, such as nautical stripes, will work well, to add a little bit of pizzazz, however keep the lightness and brightness of the room intact. For games rooms that are used for playing video games or table games, you’ll need to be able to both cancel out the light and bring more light into the room. You need to shade the screen to play video games, however you want to be able to see the lie of the table if you’re playing billiards or table top games like cards or chess. The curtain will also need rods and other hardware that is appropriate for its purpose. If it’s a light fabric and doesn’t need to be opened and closed regularly, a rod with decorator rings will probably be sufficient. On the other hand, it you have to open and close heavy drapery once or twice a day, for example in a bedroom that has a view by day but needs to shut out the noise and the light at night, then you’ll definitely want to think about a rod with a cord mechanism that allows you to open and close the drapes easily. You might even want to go remote, with a mechanized system that operates from a remote control. Rods come in all shapes and sizes. Heavy brass might work in the dining room or the lounge room, but can look overdone in a bedroom. A more private space like the study or the games room might need a wooden rod without too much decoration. For girls bedrooms on the other hand, you could use a rod that has a little more bling. There are a number of factors to take into account when choosing curtains for your home. Making sure that their fabric, cut, colour and railing matches accordingly with the current interior of the room is especially important for creating a nice, bright and airy place to live.